Mitt Romney's $10,000 wager during Saturday night's debate has gotten all the post-debate attention. And that's a shame, because what Romney said after proposing the bet also deserves scrutiny. It was about health care reform and why he objects to the Affordable Care Act. 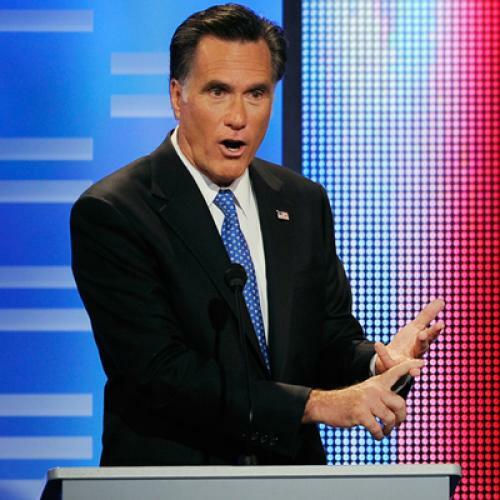 Romney's answer was hypocritical -- and, more important, it was a flat-out lie. Let's not forget, only one president has ever cut Medicare for seniors in this country, and it's Barack Obama. We're gonna remind him of that time and time again. This is false, as Politifact has already pointed out. During the 1990s, Bill Clinton signed the Balanced Budget Act. * That reduced Medicare spending by even more than the Affordable Care Act will. In the 1980s, first Ronald Reagan and then George H.W. Bush introduced major changes to the way Medicare pays for services: Reagan brought a "prospective payment system" to Medicare hospital insurance while Bush brought a fixed fee schedule to Medicare physician insurance. I'm actually not sure whether the fee schedule for physicians reduced Medicare spending in the ensuing years, but the new payment system for hospitals certainly did. And both changes were far more socialistic in nature than anything the Affordable Care Act contemplates. The fee schedule, in particular, is effectively a form of price controls. Defenders of the two Republican presidents, and the changes they introduced, might argue that these presidents weren't cutting benefits with these changes -- that Reagan and Bush were merely trying to make Medicare's payment system more efficient. These defenders would be right. But the very same argument applies to the payment reforms of the Affordable Care Act, which actually improve benefits by providing free preventative care visits and broader prescription coverage for the sickest seniors. OK, that's the dishonesty. And the hypocrisy? Romney has lavished praise on Paul Ryan's Medicare reform scheme, most recently last week, when his campaign made clear that Romney agreed with the proposal in principle if not in all of the specifics. But Ryan proposes to cut Medicare spending by more than Reagan, Bush, Clinton, or Obama ever did. And unlike most of the previous reductions, Ryan's cuts would affect benefits directly. The Congressional Budget Office has calculated that, by 2030, the typical senior would be individually responsible for more than two-thirds of his or her medical costs. Under current law, the typical seniors would be responsible for just one-fourth of those costs. Even if you make some heroic assumptions about how much Ryan's plan would reduce prices through the imposition of "market forces" and even if you assume Romney wouldn't cut Medicare by as much as Ryan would, the fact remains that Romney has committed himself to substantial reductions in the program's spending -- reductions that would leave seniors individually responsible for much greater medical costs. If he wants to attack Obama for cutting Medicare, he should admit that he'd likely cut Medicare by even more.